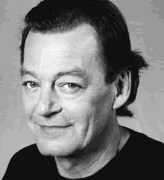 Contemporary composer and conductor Walter Boudreau was born in Quebec in 1947. He also has arranged a number of Frank Zappa compositions that have been performed by various enxembles that directed and / or conducted. In the early ninetees, Walter Boudreau worked with The Dangerous Kitchen. In 1998, he recorded an album with The Dangerous Kitchen, performing only Zappa material. Imagine a meeting between Xenakis, Frank Zappa and Pierre Boulez… The brute energy of the first, the alien iconoclasticism of the second, and the rigid constructivism of the third… Nervousness, electricity, power, inspiration, and microcosmic complexity, this is the Walter Boudreau of L’Odyssée du soleil and of Demain les étoiles. Add the complicit irreverence of the poet Raôul Duguay and the result is Golgot(h)a. Born in 1947, composer and conductor Walter Boudreau has composed nearly fifty works for various types of ensemble, as well as some fifteen film scores and two ballets. After completing early studies in piano and saxophone, he turned to analysis with Bruce Mather, a subject he also studied with Gilles Tremblay and Serge Garant in addition to composition. As a recipient of a number of grants from the Canada Council for the Arts, Boudreau later studied in Europe and the US with Mauricio Kagel, Karlheinz Stockhausen, Gyorgy Ligeti, Olivier Messiaen, Iannis Xenakis and Pierre Boulez. He subsequently undertook a number of concert tours with Jeunesses Musicales du Canada and the Festival Concert Society of Vancouver, in addition to several private workshops in digital music at Simon Fraser University in Vancouver, the Center for Musical Experiments in San Diego, and at the Université de Montréal, with the Groupe Informatique-musique. Artistic director and principal conductor of the Ensemble de la Société de musique contemporaine du Québec (SMCQ) since 1988, Walter Boudreau has received a number of commissions from orchestras, ensembles and soloists, and has directed various groups in performances of contemporary music, including the Orchestre Symphonique de Montréal, the Radio France soloists, the Toronto Symphony Orchestra, the Orchestra of the National Arts Centre in Ottawa, the Orchestre Mondial des Jeunesses Musicales (Germany/Poland), the Ensemble de Musique Nouvelle de Liège, Toronto’s Gamelan Evergreen Club, and the Dangerous Kitchen ensemble. In 1990, Boudreau was named the Toronto Symphony Orchestra’s first composer in residence for a period of three years. Together with Denys Bouliane, he assumed the artistic direction of the Orchestre symphonique de Québec’s Musique-au-Présent festival between 1996 and 1999, as well as the 2000 Millenium Symphony. As a result of these fruitful collaborations, Boudreau and Bouliane founded the Montreal/New Music Festival (MNM), an international biennial festival held for the first time in March of 2003. Grand Prize winner of the inaugural CBC Radio National Competition for Young Composers (1974), recipient of the Prix Jules-Léger for new chamber music (1982), and the Grand Prix Paul Gilson given by the Communauté des radios publiques de langue française (1991), Boudreau was recognized for his work as artistic director of the SMCQ with the 1991 Grand Prix, awarded by the Conseil des Arts de la Communauté Urbaine de Montréal. Over the years, Walter Boudreau has also been awarded a number of Prix Opus (given by the Conseil québécois de la musique), including prizes in the “Composer of the Year” (1998), “Artistic Co-Director of the Year” (2003, with Denys Bouliane, for MNM festival) ), and “Personality of the Year” (2003) categories. In 2003, he received the Molson Prize given by the Canada Council for the Arts, quickly followed in 2004 by the Prix Denise-Pelletier for performing arts—the most prestigious award given by the Quebec government in the area of culture and science. Walter Boudreau’s music has been performed in Canada, the United States, France, Belgium, Germany, Poland, and Finland.